The bookshop around the corner: Who knew internet dating could be so much fun? Who knew internet dating could be so much fun? You know how it goes, you view a profile on the internet, you like what you see, and then you agree to meet. Only with this dating scenario the man I met by the statue of King Alfred in Winchester - tall, dark and handsome as he was - did not have a carnation in his hand, instead he was the matchmaker, ready to introduce me to three very attractive bookshops. My invitation to the city came from Ben, a bookseller at P&G Wells, but as he's a sociable chap he invited me not just to visit 'his' bookshop, but also all the other independent bookshops in the city too. How could I refuse? Our first stop was The Winchester Book Shop. Taking up only a very tiny amount of ground but reaching to the stars, this shop knows how to utilise space to its advantage. And if first appearances are important then the stepping through the door certainly exceeds any expectations. A staircase winds up one corner, leading to the many floors above - wrapping around the till area where the bookseller sits - encouraging bookshoppers to look up and take in the rows and rows of attractive spines. 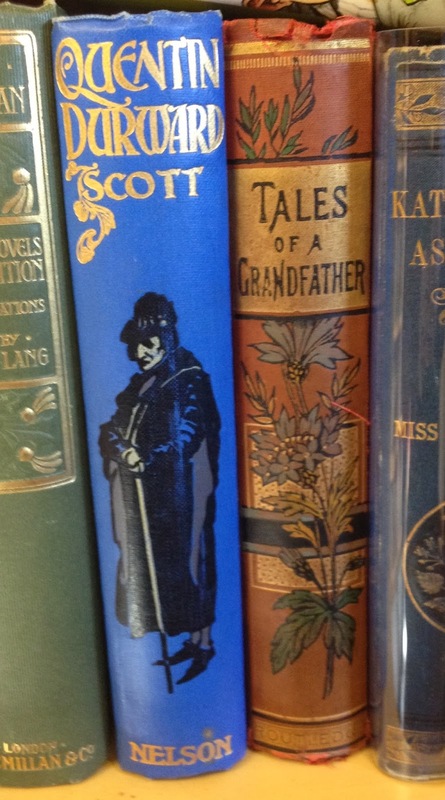 This secondhand and antiquarian bookshop - run by a collective of booksellers - is crammed with all the usual goodies, but the thing that struck me the most was the beautiful collections of hardbacks (particularly children's). Their colourful and artfully decorated spines could be works of art in their own right, and the only reason I didn't buy one is because one simply wouldn't have been enough. Instead I settled on Mark Haddon's The Red House, a topic of conversation during my visit and - purely by chance - one of the books being sold by Anne-Louise, another of the booksellers who joined in both inviting and warmly welcoming me to Winchester. On the way to our next destination we passed by the cathedral and took in the Deanery bookshop, currently housed in a couple of huts, this usually resides within the historic arches of the site. Here I picked up The Warden by Anthony Trollope so I could read about the setting at a later date. And so to Ben's 'home' and my third date, the city's new - but long-lived - bookshop. Found just down the road from the place where Jane Austen died, this literary haven is very much alive and well. With a beautiful, old-fashioned shop front housing a large and varied collection of new books, P&G Wells somehow manages to combine classic with modern and fits perfectly into its surroundings. The character, both of the people and the building, was what really struck me here. Entering a large, warm room with dark wooden shelves, topped by colourful pictures advertising the various sections, I was surprised by how cosy the bright and airy space felt. Whether exploring the broad general fiction and factual books or upstairs on the newly refurbished children's floor (which included some forgotten gems) there were delights to be enjoyed wherever I looked. I was even introduced to the resident book binder, gaining a glimpse of the remarkable workshop nestled in the back of the shop - there's much more to P&G Wells than first meets the eye. And so I'd visited three wonderful bookshop matches, but finding it impossible to choose a favourite I instead asked my matchmaker to recommend a book. Several wonderful suggestions followed before I - just to be awkward - accepted his first offering of The Garden of Evening Mists by Tan Twan Eng. This post feels like it's only scratching at the surface of the fun I had during my visit to Winchester. Wandering historic streets, meeting bookshops and booksellers and generally enjoying the glorious environment of the city meant my afternoon flew by and I was sorry to say goodbye to Ben and my three 'dates'. But rest assured, they've all been added to my little black book.